I woke up this morning and for a second I actually forgot which city I was in. In the last two weeks, I’ve been home a grand total of 20 hours. I’ve been to Cincinnati, Austin, back to San Francisco and now St. Louis. And as my loyal E is for Eat followers have noticed, my blogging has understandably taken a back seat to baseball. You’ll be happy to know I have been diligently taking photos of all of my food adventures over the last couple weeks, and I even have some back-logged posts from before I started my zig-zagging across the country. Only problem is, I haven’t had the time (or energy) to actually write about them and post photos. So I beg your forgiveness and just like my close friends know all too well...I'll be back after baseball season. Adrian Grenier!! You know...Vince from Entourage? (That's him ordering tacos, as I did my best stalker/paparazzi impression). I'm around athletes all the time, but for some reason I get super starstruck around actors. I spun around and he was standing right there, and all I could manage was, "Oh! Hello!" I tried my hardest to act cool, but I think I failed miserably. We did share some waffle fries though, so that's my new claim to fame. 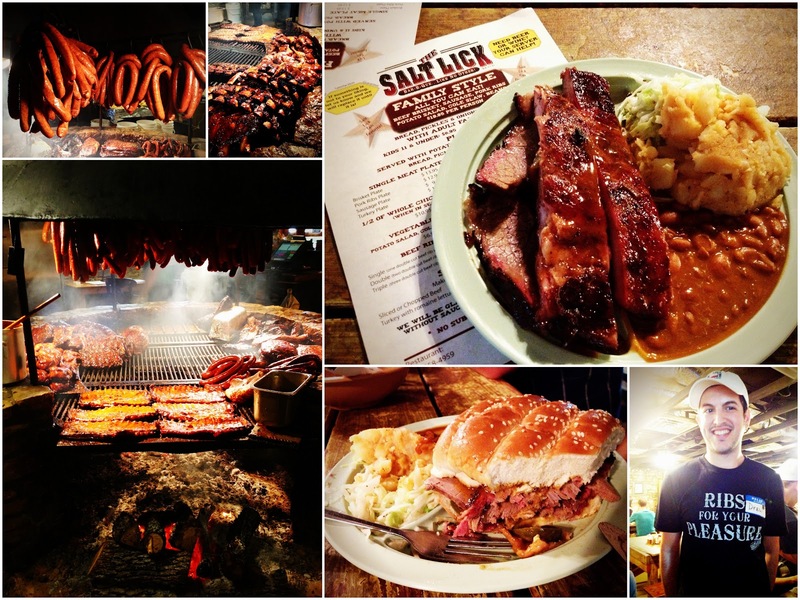 The wedding venue was about 40 miles from Austin in Dripping Springs, which isn't too far from Driftwood, Texas...home to the famous Salt Lick BBQ, which has been featured on Man vs. Food, Best Sandwich in America and Best Thing I Ever Ate. So after we finished up the rehearsal on Saturday, the entire wedding party and families headed out for some good ol' fashioned Texas BBQ. First of all, the place is BYOB, and they conveniently sell beer and wine on site. (Genius). We had a group of 25-30 people, and they were able to accommodate us by calling ahead. When I walked in, I was immediately drawn to the BBQ pit, and started snapping photos. The manager walked over, and I thought he was maybe going to ask me to stop, but instead he invited me behind the counter to take as many pictures as I wanted. (Gotta love the Southern hospitality). I was a little overwhelmed by what to order, and ended up doing a kid's sized portion of the brisket plate, which was fantastic. But, I of course sampled everyone else's food as well, and also enjoyed the ribs and the sausage sandwich. Honestly, the only thing I didn't like was the BBQ beans, but that's only because I like mine a little sweeter than they make them here. One of the groomsmen did his homework and ordered the brisket sandwich with jalapenos and habanero BBQ sauce, which I don't think is technically on the menu. I immediately had food envy. If you go, you should get that sandwich. And make sure to get a plate of their pickles and jalapenos on the side. 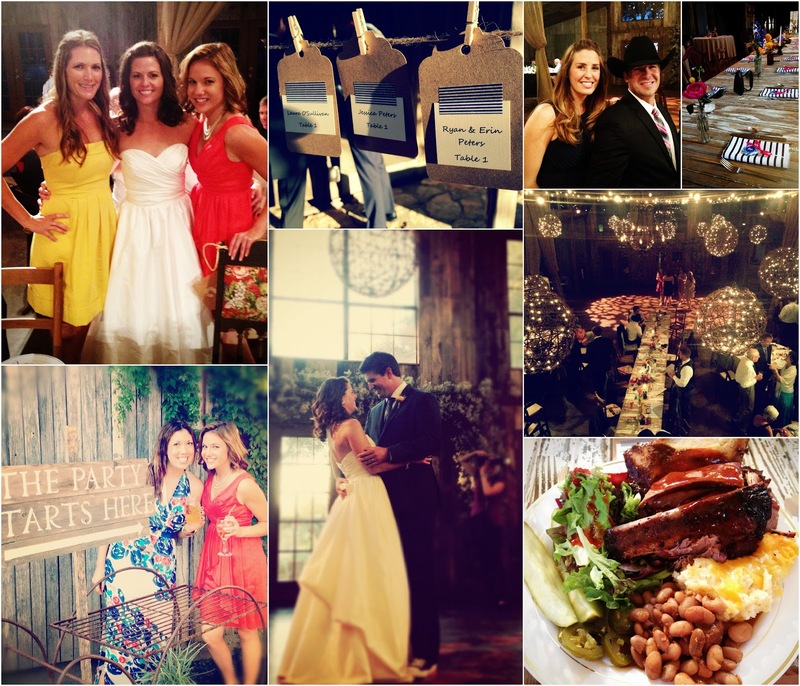 The actual wedding was held at Vista West Ranch in Dripping Springs. Wow. What a gorgeous venue. It flawlessly mixes country chic with rustic with vintage in a really elegant way. (I was obsessed with the big farm table and vintage chairs used for the bridal party). Erin did a fabulous job with the planning. She had so many little personal and creative touches, I can't begin to name them all. A lot of people really got into the spirit and even sported cowboy hats (our friend Bryce was super stoked about his new Stetson). We again enjoyed some Texas BBQ, this time from Pok-e-Joe's and I declared it one of the best ribs I had ever eaten. (Tie with OK Joe's in K.C.) (I also may or may not have grabbed seconds of those cheesy potatoes). I only wished I could've spent more time in Austin and enjoying time with my friends....but as you know, duty calls! I left first thing the next morning for San Francisco to cover Game 2 of the NLCS, and then jumped on a plane the next day for St. Louis for games 3, 4, and 5. More to come once I get a chance to catch my breath (and remember what city I'm in)...but for now, Congrats to Erin and Ryan! I'm so glad to hear that someone else had the same experience I did in Austin! My wife surprised me for my birthday last year and flew us to Austin for a Longhorns football game (i'm a big fan and now she is too), and she made sure we had 3 days in town to try the food. We ate at South Congress Cafe, Home Slice Pizza, Kerbey Lane Cafe, and had the Hangover Burger at the Driskill Hotel. Met the chef at the Driskill and he was happy to hear we were in from Northern California since he'd previously been a chef at a resort in San Bruno. He went on to suggest we try the Salt Lick and Second Bar + Kitchen, and Home Slice. Unfortunately we only had 1 meal left in town so we went with Home Slice (since we didn't have rental car to get to Salt Lick, we'll have Zipcar next time!!). So we definitely have some food to go back for next time! The people of Austin were a wonderful group, I couldn't believe how well we fit in with everyone there, and how easy it was to just enjoy the city and feel like you belong. Great time! Glad to hear you enjoyed too! This sounds amazing siiiiiister! And congrats to Dialie! Poor Mays must miss you, just like me. Love you, xoxo.